Marketing is about more than just campaign management, data warehousing and social media; it's really more about connecting everything that has to do with revenue. 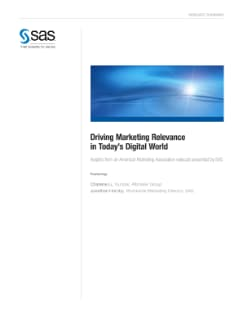 A recent AMA webinar, sponsored by SAS, examined this concept, exploring how breaking down organizational silos, encouraging and celebrating risk-taking, and recognizing every employee and customer as a potential marketer were key strategies for driving the relevance of marketing in a digital world. This paper provides a summary of that webinar.